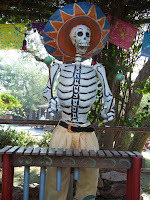 November 1st begins the two day celebration Dia de los Muertos. 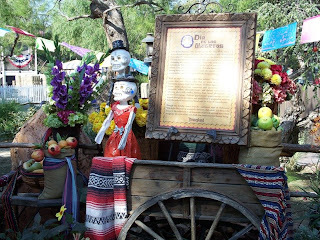 For the 2007 celebration, Disneyland placed some extraordinary pieces in Frontierland, along with Disneyland’s edutainment plaque on Dia de los Muertos. 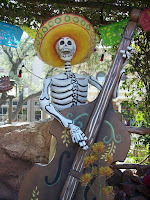 “Dia de los Muertos” (the Spanish phrase for “Day of the Dead) is observed each year upon All Saints’ Day (November 1) and All Souls’ Day (November 2). Stemming back to the days of the Aztecs, the holiday is a festive occasion that honors those who have passed away while also celebrating the continuation of life. Those who celebrate this holiday embrace the belief that death is not the end of our connection with others. Love goes beyond the grave. In Latin American cultures, and among many cultures around the world, the annual celebration brings communities together to honor both the living and the dead. With an emphasis on joy rather than sadness, “Dia de los Muertos” comes alive with vibrant colors that are iconic to the celebration. 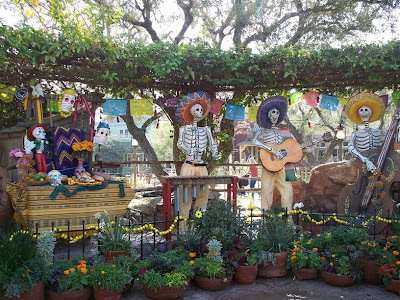 Traditions include displaying “calacas” (skeleton figurines) dressed in festive attire, decorating cemeteries and gravesites with orange marigolds, yellow chrysanthemums, and fuchsia cockscombs, and adorning altars with candles, flowers, fruit, bread, photographs, and treasured belongings. Delicate “papel picado” (paper cutouts) are often draped through the streets, and special food is prepared to welcome back the souls of ancestors and loved ones for a day of remembrance. Though this holiday comes near the traditional time of Halloween, “Dia de los Muertos” is an entirely different celebration. For those who honor it, the celebration is an important social and spiritual time which recognizes the cycle of life and death that connects every human being. 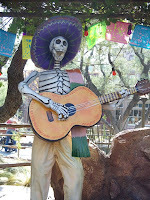 Thank you for educating me on the Dia de los Muertos - and such fantastic pictures too!